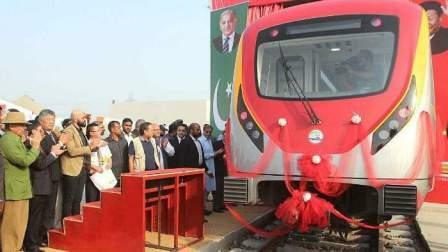 The Orange Line Metro Project was unveiled by Punjab Chief Minister Shehbaz Sharif in Lahore on Sunday. He said the project will make conveyance easy for everyone. "This is the best inter-city transport project," Sharif said. Sharif said the project is meant to make the underprivileged feel that "they have equal rights on the state resources as their rich counterparts. it aims to create equality." Twenty-seven trains are likely to cover the distance as per the route built up until December 25 - when the project is set to be launched. A single train has the capacity to carry 1,000 people, out of which 200 can be seated while 800 can commute while standing. The project has also been included in the China Pakistan Economic Corridor. The metro train is expected to run on electricity and to transport up to 250,000 passengers a day. The capacity will be increased to 500,000 passengers by 2025. Launched in May 2014 by the Punjab chief minister, in collaboration with a Chinese company, the project will be the country's first metro line. The construction for the project began in 2015 and was personally supervised by Sharif. Costing $1.6 billion, the 27-kilometres rail line should have been ready by mid-2017 but got embroiled in a legal battle in the Lahore High Court. The court ordered a stay on several sites as the development was trampling over heritage sites in Lahore.